Songdo International City, part of the Incheon Free Economic Zone (IFEZ), is in the global limelight as the world’s best bio industry hub surpassing bio clusters in San Francisco Singapore and Ireland. The IFEZ has recently announced a plan to expand Songdo to be a global bio hub. It has signed ambitious MOUs with industry, academia and research entities. Songdo’s bio industry has made remarkable achievements, including securing of the world’s largest bio pharmaceutical production capacity in terms of a single city. Geographical advantages, including proximity to Incheon International Airport, been highlighted to investors and research institutes around the world. The IFEZ recently hosted a symposium at Songdo Conventia in Incheon on the building of a global bio hub, in which it announced the bio hub plan and signed MOUs. Under a strategy to become the world’s best bio hub supporting the growth of global companies and manpower, expanding area, upgrading the value chain, and strengthening infrastructure, IFEZ Commissioner Kim Jin-yong revealed the plan to develop a 990,000 sq. meters for the 11th construction section, in addition to the already-prepared 4th, 5th and 7th construction sections, which have a combined 910,000 sq. meters. The major goal is to attract R&D, manufacturing and service companies in the global pharmaceutical, medical and health care fields. To do so they will build infrastructure to support competitiveness in R&D and commercialization, and nurture an advanced bio industry combining key technologies of the 4th Industrial Revolution, including AI, big data and IoT. 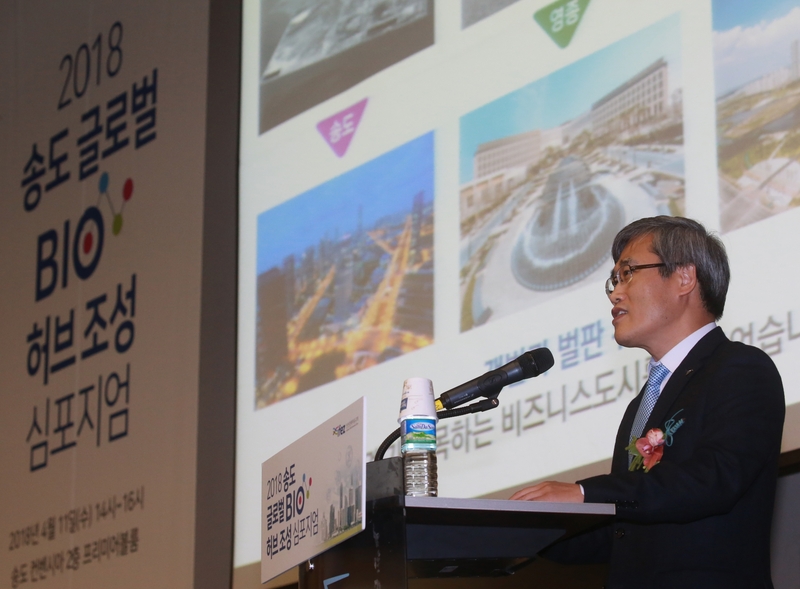 IFEZ Commissioner Kim also proposed a vision to make Songdo a “medical multipurpose town” by building Songdo Severance Hospital, whose opening is slated for 2024 on the Yeonsei University International Campus, Science Park, which will be created at a 1,386,000 sq. meter area in the 11th construction section, and the Brain Valley of Gacheon University Gil Medical Center. The IFEZ commissioner also announced a plan to build the Bio Convergence Startup Venture Polis, which calls for establishing a bio process manpower development system to offer practical training for R&D and production process manpower, which is needed by Korean and foreign bio companies wanting to explore global markets, among others. During the symposium, IFEZ MOUs were signed with eight industry, academia and research organizations, including Yonsei University, Incheon University, Ghent University Global Campus, Celltrion, and Samsung BioLogics.. The MOUs call on the parties to attract tenant companies and promote cooperation among industry, academia and research circles. In particular, in a commemorative speech to the symposium, Deputy Vice Minister Kim Young-sam of the Trade and Investment Office at the Ministry of Trade, Industry and Energy (MOTIE) said, “The IFEZ and the MOTIE will make joint efforts to make Songdo here a cluster, an equivalent to the one in the United States, so that universities, research institutes and innovation companies’ proprietary technologies and ideas can lead to development of new drugs, and the pharmaceutical industry with a focus on Incheon is sure to establish itself as a key growth engine of the national economy down the road.” The city has secured the world’s largest bio pharmaceutical production capacity of 560,000 liters. Songdo has become a Korean city whose tenant companies have produced seven, the largest-ever, out of 10 bio medical products permitted as of the end of last year―four from Samsung BioLogics and three others from Celltrion. Sondo’s designating of a cluster of the Korean bio industry’s production and overseas market entry in accordance with the government’s master plan on the nurturing of biotechnology manifests that the city has become a driving force in the Korean bio industry. Songdo’ plots for industrial facilities and education & research have attracted 25 bio-related organizations. If small organizations accommodated in Songdo’s knowledge industry centers and research/office facilities are counted, the number will top 60 in all. The biggest features of Songdo’s bio hub are Celltrion’s opening the global biosimilar market by releasing Remsima, the world's first biosimilar monoclonal antibody (mAb) medication, and Samsung BioLogics’ owning the world’s largest bio pharmaceutical production facility capacity in terms of a single company, which were followed by successive large-scale investments by global companies. IFEZ President Kim said, “The value of the global bio industry is forecast to jump from $323.1 billion in 2014 to $427.3 billion next year with an annual average growth rate of 5.7 percent, and among them, the value of the global bio pharmaceutical market grew to $179 billion in 2014, twice that of the memory chip market, indicating the bio industry as an area with global high growth potential.” Kim revealed his determination to devote himself as the head of the IFEZ to creating the world’s best bio hub topping global bio clusters in foreign countries, including San Francisco and Singapore.